sythong – I will always sing my heart out. I will always sing my heart out. The theme for English round three is identity. Because we are at the age to start planning our future and thinking about college, the aim of literacy this round is to start understanding more about ourselves and or course start writing college essays. In total, everyone wrote three essays, but choose only one that they think is the best and would get them into a college if they were to apply. The essay below is about my relationship with science. Enjoy reading! Science has opened realms of understanding for humans ever since it came into existence. It is a way to explain concepts with proof and reasoning. But for me, it is beyond that. For me, science is more than a subject at school or a topic to discuss to sound nerdy. Science is part of me, that I still have yet to learn about. I am intrigued by science and especially intrigued by how it influences me. In Cambodia, opinions of a child are seen as less important than the elder’s’. But science taught me to break that cultural barrier and have my voice be heard when I refused to drink honey with energy drink as replacement for a vaccine of a newly discovered hazardous disease that didn’t even affect Cambodia. Back then, even though I didn’t fully understand how vaccines work, I was able to piece information together and be an advocate for what I believe in. Science taught me to make better choices in my life. That does not limit to only my choice of diet and lifestyle since it taught me to be a critical thinker. I’ve learned to ask questions and explore more than one side of a story or topic before picking my stance. I’ve become a critique of my own thought in choices and decisions making. Science helps me cope with mortality and sometimes other personal matter. It explains death and the cycle of life in a way that is soothing and complete. It helps me stay calm and not freak out over physical symptoms that others may take as signs of lethal consequences. It helps me understand what healthy is and not diet to fulfil the beauty standard by the unspoken messages of society. To name a few, these are only some ways science help shape my everyday life. Soon, it will too, shape my future. Science will help me to unlock doors to knowledge that will enable me to save lives of people who need medical care and empower science in my home country just like it has empowered me. It’s been about eight months since LRMT was last on the island. What we’ve been dying to see is our research site and how it has changed over the course of the months. We were expecting to see some growth in seagrass and an increase in species richness and abundance. What we actually saw and heard was unanticipated. We had been told by the staff at MCC that the bamboo structure (also known as cluster) has been cut and left stranded in waves of the vast ocean. They found it and retie it only to be cut off again. After it was cut for the second time, MCC let the concrete structure we deploy sit underwater without a marker for a while. And that is not it! We got to witness the condition of our blocks in the murky water. About one-third of the concrete structure is buried in sand and sediment. Surrounded them were fishing net and trash. What we concluded happen was that some fishermen might cut off our cluster and trawl the area that has attracted commercial fish species. As a result, the hexagonal block structure was dragged across the ocean floor, bump into the three tiny hollow cubes and sink into the sand before it snatches off the net. It was sad to see what we have deployed being ruined. But at the same time, we were glad that the block is doing its job. After all, we are doing a real-life research! 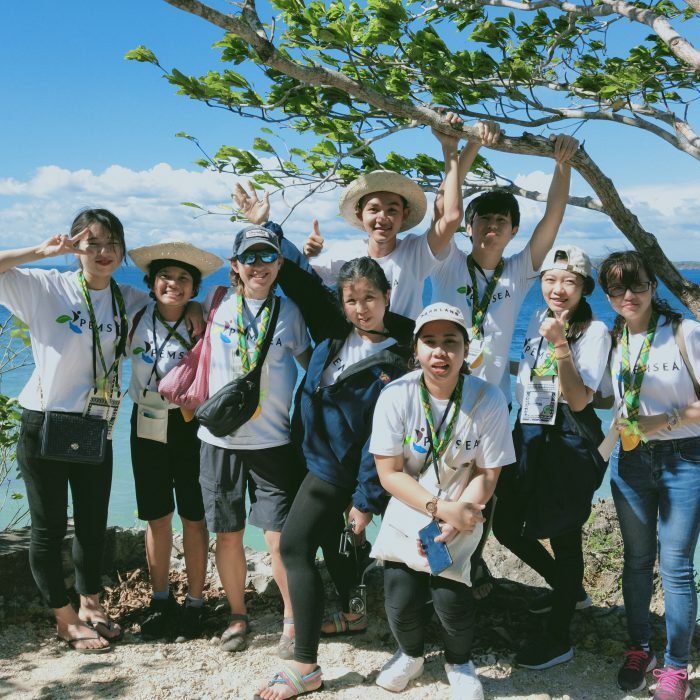 Sadly, we did not get to survey our site….because of the consistent bad visibility, but we got to make more bamboo clusters and clean the beach and keep being ocean advocates. Moving forward, we would develop our research project and work on making it a sustainable project. In this unit, we focus on introductory to in-depth Khmer grammar. In doing so, we studied two Khmer novel, one of which called Tum Teav about love between two people of different class, and the other is called Melea Doun Chet which is about love between two people of different race and class. These two novels have a very different setting and plots but they all communicate the same thing: class and social status don’t matter in a love relationship. Back in time, parents in Cambodia usually arrange a marriage for their children to someone of the same class. Love relationships between classes were forbidden because they do not want their children to be involved with someone from a family that is inferior to them. But of course, attraction and love can’t be stopped. At some point in history, young adults start to revel against their guardian to live with someone they truly love, but the result never ends well. Seeing this problem, a writer of that time wrote a novel called Tum Teav. Tum is the name of the male character, while Teave is the name of the female character. They were deeply in love even though they weren’t supposed to. When the first met Tum was a monk, a religious figure who is to not date or want anything thing more than what they need t to survive. Because of his strong attraction, Tum decided to quit being a monk to reunite and prosper with his girlfriend. By then, he was almost too late. Teav’s mom had decided to offer her as the mistress of the king of the is wealthy and powerful. Luckily for him, he was there to declare his love relationship with his girlfriend. Awed by his bravery, the king gifted the coupled with a marriage. They were all happy, except for Teav’s mother. She wanted her daughter to marry someone wealthy, so she devises a plan to trick her own daughter to leave her husband and marry someone else by lying to her that she is sick and really want to see her daughter. Teav did not know about her mother’s plan, went home immediately to see her mom but was captured and forced to marry the next day. To her luck, someone offered to pass this information t her husband who rushes to her home as soon as he receives the letter. When he got there, things did turn as expected, and so the couple ends up dying under their love tree. The novel ends here to leave space for readers who guardian to reflect and they story and think about what they would do as a parent through considering they rather having their kid being dead by forcing them into a marriage. Not surprisingly, many people who have read this novel which is written in a poem associate it to Romeo and Juliet by William Shakespeare, because they both have a similar story and communicate the same idea. This second unit of our literacy class, our main focus is communication. We learn not only to communicate through spoken but also written words. One of the topics covered was active listening. Through this topic, we realized that we mostly listen to speak, listen so we can interject our ideas, and not listen to listen. Active listening is really skill important to have because, in a complex problem or conflict, it requires us to open our mind and hear what others have to say. Active listening also shows a person speaking respect, for an example if they are speaking about a topic that sensitive, it is best to give them all the space they need, and not distract their thought and speaking process. To practice this skill we now learn to be very important, we spent one hour of our class time just talking to classmate whom we are not so close with. We were to pick a partner and share something about ourselves that matter to us or speak about something that we are passionate about. I paired up with another girl in my literacy class who also share many other classes with me but never interact often enough to considered close to me. We found a comfortable room and sat in a chair face to face making eye contact as one person talk and the other listens. With that, something miraculous happened. We allowed ourselves to be vulnerable and share stories we don’t often do about ourselves: stories we don’t feel comfortable talking about. Through this, we able to connect to one another very closely, as we soon realized that we have so many things in common. I felt as though, I learn and get to know her better in this one hour than I had in six years we had been in a boarding academy together. Anyways, that is just one aspect of our unit. Another aspect is etiquette writing where we focus on writing professional Emails and making résumé. In this topic, we learn and practiced writing professional to someone we have never met. We pretend that we have to ask a fashion company for an internship company through Email. It was a really great exercise for us to do because we actually send the Email to someone we know who has been working on communication for longer than we have existed. We got feedback and suggestions on our Email to help us grow as communicators. Lastly, we dive into video conferencing. In this session, we learn how to group call which can be a really difficult task to do. It is already awkward to just call someone and try to make eye contact with them by staring at out PC camera, doing it a team makes it even trickier. But through our lessons and practice, we learned to divide roles in video conferencing and group calling easier to archive. But good networking and communication skills don’t come to us naturally, so we have to always keep practicing. Yeasts are known to be used for making beer and bread, but how do they actually contribute to these products? The answer is simple: anaerobic respiration. Plants and animals need to constantly respire to sustain their lives. This means they need to respire no matter air (oxygen) supplies is available or not. This brings back to anaerobic respiration. Anaerobic respiration is when an organism has to respire without oxygen, and aerobic respiration is when the organism respire with the presence of oxygen. Given this, it is still unclear how yeast help make bread or beer. How do they actually do this? To answer the question, let’s explore into the process of anaerobic respiration. In anaerobic respiration, organism goes through fermentation, a process to restore the materials needed for the next respiration process. Normally, organisms would not do this, but because of the lack of oxygen, they have to. In animals, they go through lactic acid fermentation. This lactic acid causes the pain that can be experienced when we exercise because through exercise, we do not get enough oxygen. Another type of fermentation is alcoholic fermentation, a process that plants including yeast (fungi) go through. By going through anaerobic respiration, yeasts use sugar molecule to act upon and produce some energy and carbon dioxide and ethanol as their byproduct. That concludes why yeasts are used for they are used for. In making beer, the ethanol they produce is favored. In making bread, the carbon dioxide they release is favored for creating air bubbles in the dough as well as to raise the dough. In a lab for AP biology this unit, we conducted a yeast respiration lab to observe and learn the process described above. 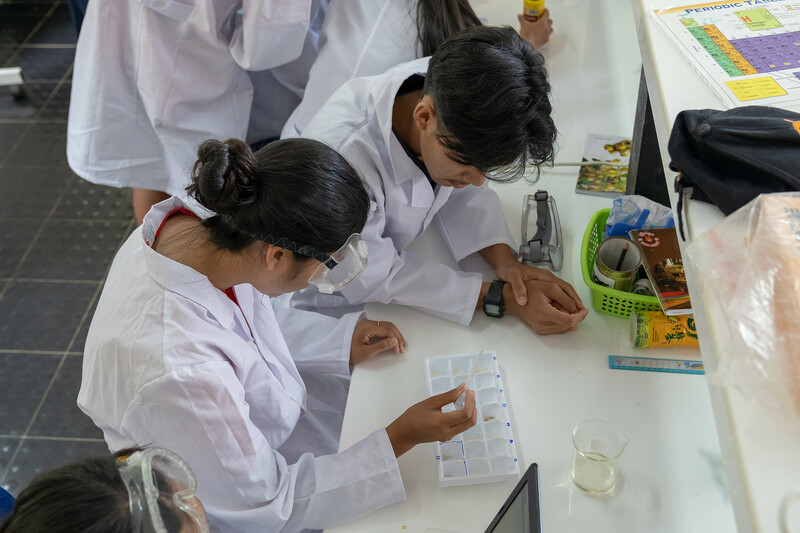 In this lab, we immersed yeasts in different solution such as, distilled water, water and sugar, honey and water, water and Royal D and water and vanilla extract which are stored their own flask. At the rim of the flask, we attach balloons that would be inflated when yeast respire to see the variation of yeast respiration rate within our different solution. After the experiment is set, we let the flask sit for an hour before we make our observation. To our surprise, the balloon attached to the flask that holds water and Royal D was inflated the biggest, followed by water and sugar. This means that Royal D holds materials that are favored in yeast respiration; it holds not only sugar but also vitamin and potassium. This may explain why the balloon attached to the Royal D flask was inflated bigger than sugar. As can be seen in the photo, none of the other ballons were inflated. 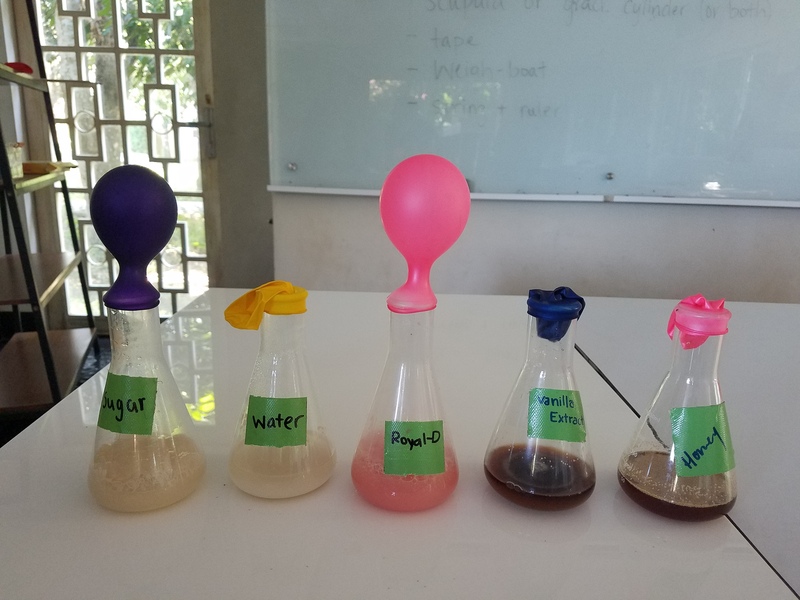 It is no surprise though that the balloon attached to the water and vanilla extract were not inflated because they do not have sugar which is needed in respiration. Honey, howeve,r came as a little shock, but we hypothesize that the sugar molecule it holds may be too big for the yeasts. In this round, we start our pre-calculus class. We start with a review of functions and quadratic equations, then move to a more advanced math as we proceed in our class. Throughout our class, we do a lot of independent work to allow each and every one of the students to work through the lessons with our own pace within a time constraint. One way we archive this was using the online platform to practice math, particularly Khan Academy. On this platform, we practiced solving the following: functions, polynomials, rational relationship, exponential growth and decay, exponential and logarithmic functions, radical relationship, and trigonometry. Below are some pictures of what the exercises on Khan Academy look like. Another way students were allowed their own space to learn is, we are given an assignment for a span of time. Within this time, students get to decide the time to do their work and the focus of their study for this class within this time. Nevertheless, we work together a lot. When there is a challenging problem we find either in our textbook or on an online platform, we would bring it to class and look at it together. This way, we can solve the problem better and faster. From time to time, we all shine in a different way when solving the problems, because we have our strength and skills. I, for example, am really good at seeing and visioning shapes in my head, other students are good at other things, for instance, seeing relations between equations. Others are good at recalling principle and laws that we learned to apply it to problems and solve it all together. Whenever we solve a problem in class together, it is my favorite part because it feels like bringing different experts to solve a complex math problem. On that note, we help each other learn and grow as a math student. During this unit three of our chemistry class, we focus on molecule and bonding types. Within this time span, we did a lab that is not really related to our focus but was a lot of fun. The lab we did was on pharmaceutical drugs, where we test for different properties that they possess such solubility, pH, and their reaction with “stomach acid” in which we used vinegar as a replacement. After our many tests and data collection, we write an analysis of why we think the drug was made to have the specific properties they have, and why the solubility of the drug is important. Through this lab, we were able to practice our lab-conducting skills and critical thinking skills. I really like a random lab in a unit like this, because it opens a span of view of how fun chemistry can be. Lux and I attended the youth congress which wasn’t open because it was for youth ages 18-35. 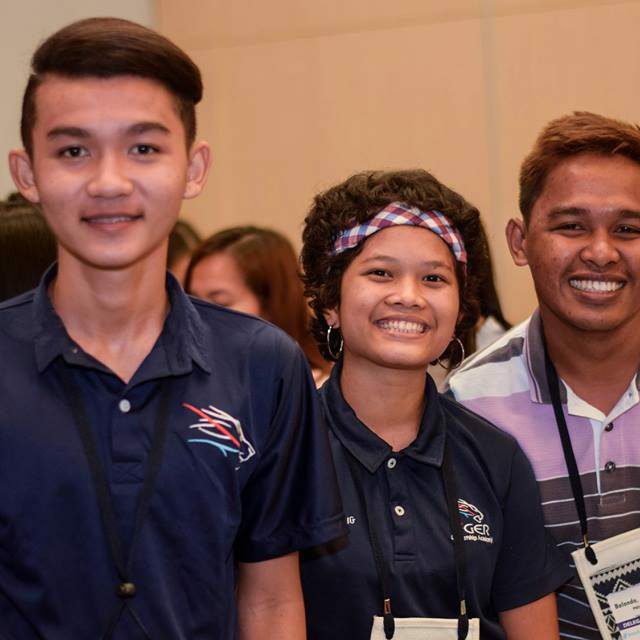 With the work that we have done and the accomplishment we made, we were allowed to attend the Congress even though we’re 16. Our adventure started on the 25 of November, where we board our flight to Manila and finally Iloilo. We got to our destination the next morning and were able to meet other youths at the hotel organized for us by the congress. Later, in the afternoon, we registered ourselves for the congress and attended the events held there. Our focus was the work the youth declaration which holds the voice of youths’ commitment who attended the Congress in a form similar to the UN resolution declaration. In addition, we also prepared for the official launch of the Congress the next day; Lux was selected as the flag bearer for Cambodia. At night, we went out for dinner with other youths near a supermarket which is a five minutes walk from where we stay. Then, on the 27, our day started with two hours of open speeches from people who work for the government and especially in conservation. Then, before lunch, we visited the exhibition hall to see different projects that were on display in booths. We also got to meet governor from Sihanoukville, Kampot, Kep, and Koh Kong who were there to be the voice of Cambodia. Later, we were engaged in a presentation about Climate Change; we role play as countries representative and discussed on topics that frequently discussed among countries regarding climate change. On the 28, there were even more exciting event happening. 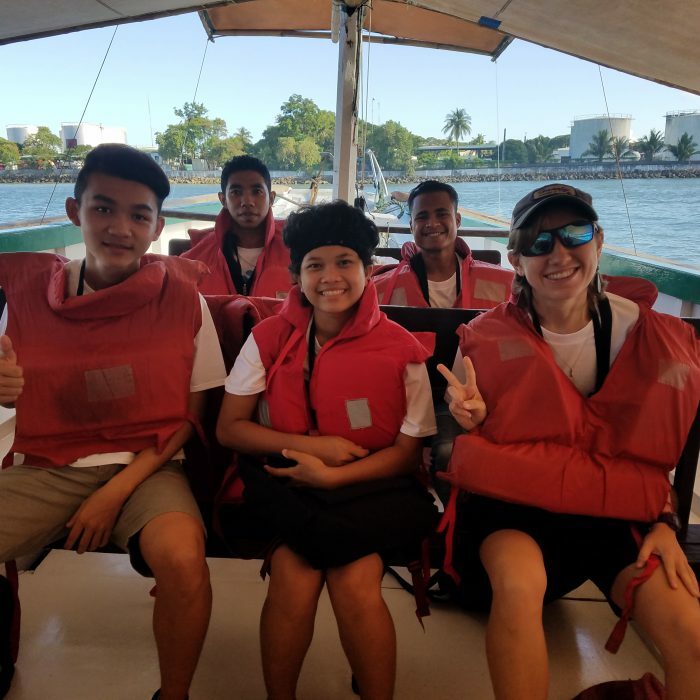 We got into one of the six groups: mangrove conservation, plastic waste, coral reef degradation, illegal fishing, water pollution, and overfishing and work to brainstorm solutions regarding our topics and the actions youths can take to be part of the solution. Kieran, the facilitator who was at the got conference with us got mangrove conservation, Lux got coral reef degradation, while I got plastic waste. Moreover, Lux and I got an opportunity to talk about LMRT and Marine Conservation Cambodia (MCC) as part of the knowledge sharing of good practice agenda. This went really great well. 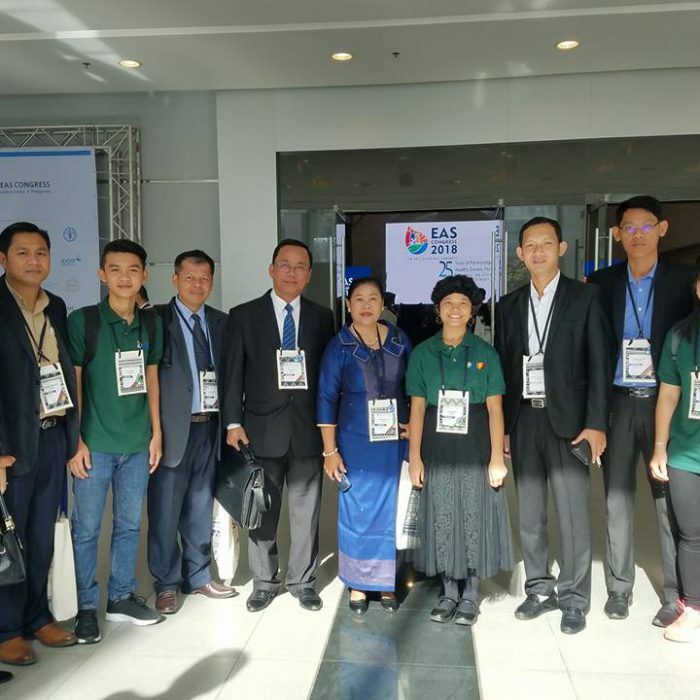 The other delegates were impressed by how we have represented our academy, team, and youths of Cambodia. Many of them approached us during and after the lunch break to tell us about how great and inspiring our presentation was. Approaching the end of the conference, we are already on the 29 of November! We attended the closing ceremony and learned something really shocking to us. 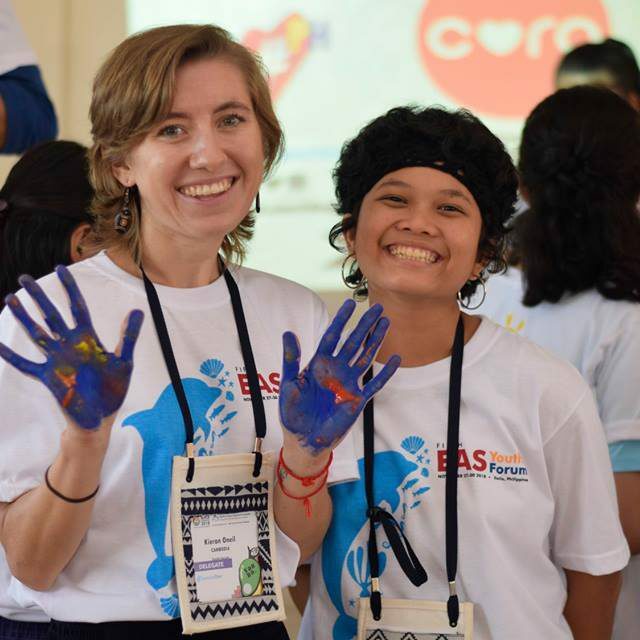 Cambodia has the honor to host the next EAS Congress in 2021! I am looking forward to joining this next conference, even if I may be a university by then because unlike other conferences, it doesn’t end when the conference ends. We have a Facebook working group, where all the youths will discuss what each of us can do to help heal the harmed ocean in our countries and the ocean of the Eastern Pacific region. Anyways, in the afternoon we went to an elementary school and did something called dalaw turo which translates to visit to teach. We were there to participate in ocean conservation awareness campaign with the students there. It was a lot of fun to be there and especially to see how the kids are eager and keen to learn. After the Congress has ended, all youths delegates went on a field trip to Guimaras island—the island of mangoes— as organized. There, they have so many different types of mangoes that are popular not only throughout the Philippines but also the world. They export their mangoes to the US, UK, Australia and other countries like Japan. Besides the mango, we also learned about the Igang Bay Marine Sanctuary there which covers an MPA with integrated zoning that is 43 hectares large. They do seagrass monitoring, coral farming, deploying artificial reefs and monitoring, and patrolling the area 24/7. Their work since 2006 has done a lot especially in helping the ocean restore itself from the mass oil spill in that same year. Today the area is very minimally affected by the oil which is really great news. The trip visit to the many organizations at Guimaras ended in the evening where we have time to get ready for the farewell dinner. It was a lot of fun but also sad to say goodbye to our new friends. But the good news is that we now make so many new friends from ASEAN countries. I made some really close connection with Taeyoung and Yuri who are from South Korea. I still keep in touch with them today. 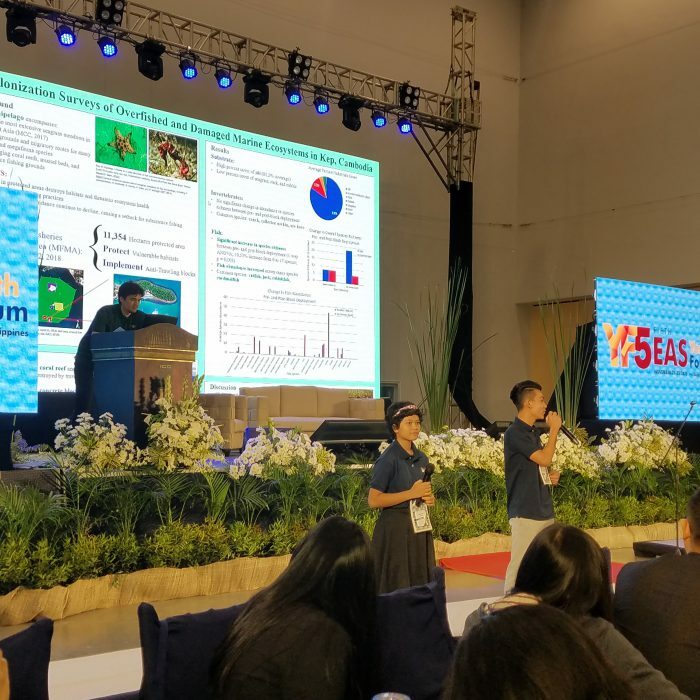 In a nutshell, the Congress was a really great opportunity to learn about ourselves and others and what we want to do for our ocean. It is a way to get more inspired while also meeting other inspired youths. November 26. Getting to know other delegates. November 27. The official run of the opening ceremony. November 28. Presenting about LMRT. In the second unit of AP biology, the subject content focuses on the cell. So far, we learned about the different types of cell and the basics of the evolution of eukaryotic cell. Because we will mainly learn, about eukaryotic cells, we did a fun project called “cell yourself” to help us understand cell in an amusing way. In this project, each student in the class was assigned an organelle or part of a cell that they would have to do research on. After the research, we would have to be creative and pretend to be our assigned organelle going for a job interview. This means that we dressed in a costume that represents our assigned item and act like our organelle for the day of our “job interview”. I was assigned the plasma membrane which act as the bound between the cell and its environment. In addition, it also act as a gate that let material in and out of the cell, a structure for the cytoskeleton to attach to which gives the cell its shape, and communicator for the cell (when they bond with adjacent cell to form tissues). To represent my part of the cell, I wore camo clothing to depict myself as a protector of the cell since soldiers (a protector of a country) wear camo clothes. I wear my hand -made earing composed of a bead and two pieces of trailing yarn to represent the phospholipid bilayer that make up the plasma membrane. I wore a cork necklace to represent the carbohydrate present on the plasma and lets bodily cell recognize each other. Lastly, I name myself Plasmano Elsie Membriano. During my “job interview” I talked about how vital I am to the “company” (the plant and animal cell), and was at last employed after persuasive speech of “celling” myself. During this first round of literacy unit, our class focus mainly on reading passages that are about the American history to help us better prepare for the upcoming SAT test. So far, we’ve read about the liberty of America, slavery and their civil war, the meat packing industry, their shifting views on immigration, the great depression, and their involvement in World War II. We learned how the result of these past events still influence America today through our students-facilitated discussion and our independent response to the article we’ve read. Doing this has really helped me; it gives me more context of understanding when I have to read the history passages of the SAT where the narrator allude to historical events. On the other hand, it also help me build up my vocabulary. After reading every passage, we would have to identify, the words we don’t already know or words we don’t feel comfortable using then find its definition and write some sentences for them in a document which we call it the Vocabulary exploration. 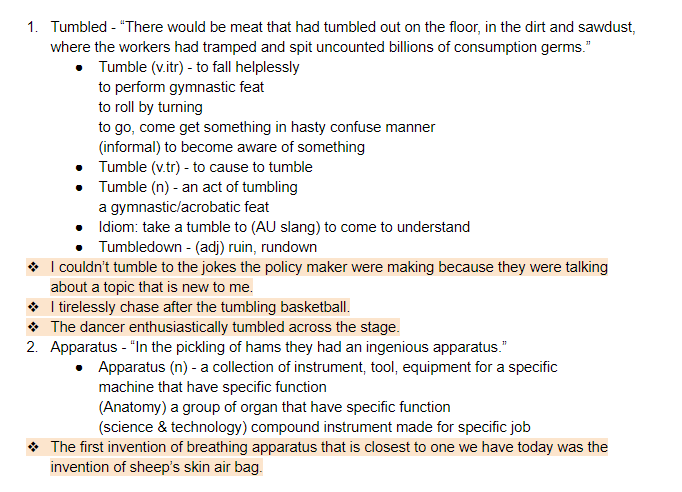 An Example of my vocabulary Exploration. My name is Sythong (see-thong (sounds like song)). I live in northern part of Cambodia; not too far away from the Thai border and that explains the origin of my name. It means “golden”or “color of gold;” see (sy) meaning color and thong meaning gold. Science and singing defines me. I explore science as my interest and sing almost everyday to make sure I am not stressed out. When I have free time I like to read science articles and also reading for pleasure in general and crafting. I like to keep my mind open and get ready for my life adventure that awaits ahead of me through learning because I feel like many people take things we know for granted.